Hark! Hear the herald of the power meter’s ring! What is that beacon that shines just over the horizon in that little town of Hamilton? Behold! It is the Martel Christmas Wonderland! The season is upon us once again when the New Jersey residence that puts Clark Griswold to shame year after year is fully illuminated – The “Hamilton Christmas House” as it is known to the casual passerby, Bob Martel’s House as his friends and neighbors call it, or as it is officially known, Martel’s Christmas Wonderland, is plugged in, powered up, and open each night until about 10 PM. Brightly lit and surprisingly quiet, even when crowds gather to stare in gleeful amazement at the radiant glow of its incandescent grandeur, the yards of a modest two story home on Phillips Street are jam packed with every blow-molded polyethylene electrically illuminated Christmas Holiday figure known to mankind – close to two thousand of all types and every descriptions. (I will take an official stance that it is nearly impossible to count with any certainty, as Bob keeps adding more stuff.) 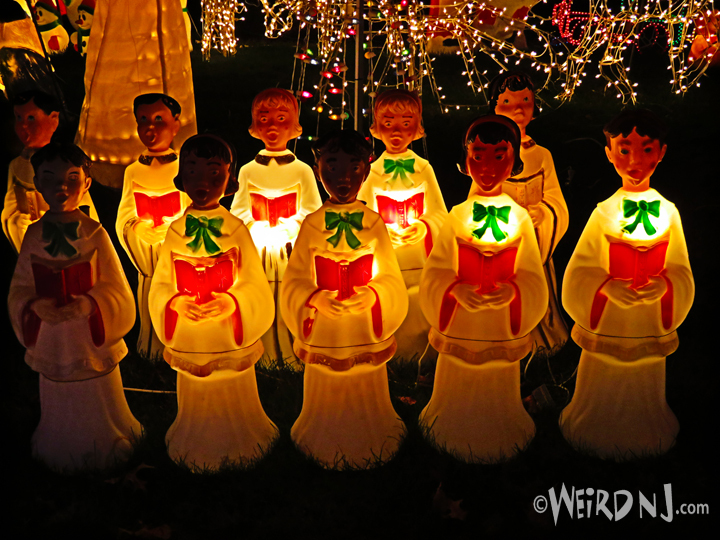 Though there are far too many to list them all, there have come to be: wooden soldiers, choirs of angels, nativity scenes, Santas, elves, cartoon characters, animals, and even a 20-foot tall inflatable Santa this year in the annual display. Kids and adults alike love to bask in the glow of incandescent colors and hear the repetitive recordings at the various displays emanating their holiday jingles. There is even a huge, singing 6-foot Bass on a Plaque with a Santa Cap on it. This holiday season give that hard-to-shop-for person on your shopping list the gift of weirdness with a 2019 subscription, one of our Wicked New Hoodie, a Special Issue, Skull Cap, T-Shirt or any of our other great stocking stuffers. All available through our Web Site or Amazon Store. Bob buys up whole collections of other people’s displays to incorporate into his own. Once, at a flea market where he had just closed a deal with the seller on EVERYTHING in the store, a lady yelled out: “Hey! I was going to buy that! Let someone else buy something!” (then mumbled something about eBay under her breath). Bob kindly explained to her what he was doing with it all and she froze, looked at him with a smile and proclaimed: “Oh! You’re The Christmas Guy from Hamilton! 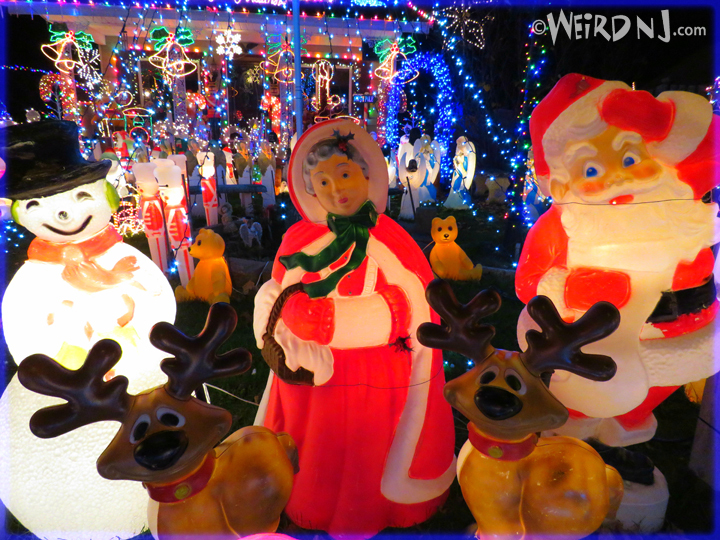 We love that place, we go every year!” Needless to say, she changed her tune, which is only right, as in Bob’s care those decorations will be seen by untold thousands of visitors each year. The grand display has opened on Black Friday each season for the past 29 years and typically runs until about the first week of January. On Sundays you might even catch a glimpse of ol’ St. Nick himself! It has been a generational favorite with parents who visited as children and now bring their own kids. Some holiday travelers make the pilgrimage several times each season when the Wonderland is up and running to see the truly remarkable spectacle continue to grow. If you meet Bob Martel, you’ll see the pride in his eyes and he’ll be quick to tell you about the generation of visitors who come by year after year…from what I can plainly see, that is what motivates him, that gift of visitation and marvel. As this massive festivity grows each year, it has begun to expand onto a willing neighbor’s yard, but Bob responsibly takes care to preserve his neighbors’ parking spots with cones to reserve their spaces. Visitors are also urged to please park with courtesy and care, it is the NJ way. Although the display is 100% free for all to marvel at, if you’d like to leave a token of appreciation to the creator of this amazing attraction it would likely go to offset the 1700-2000 dollar power bill Bob Martel pays to PSE&G each month. Now that LEDs are all the rage, the annual financial damage of the display is starting to drop gradually, with the savings being due to the more efficient lighting. But the power meter continues to spin fast enough to throw a clay pot onto. See for yourself, it’s in the driveway on the side of the house. 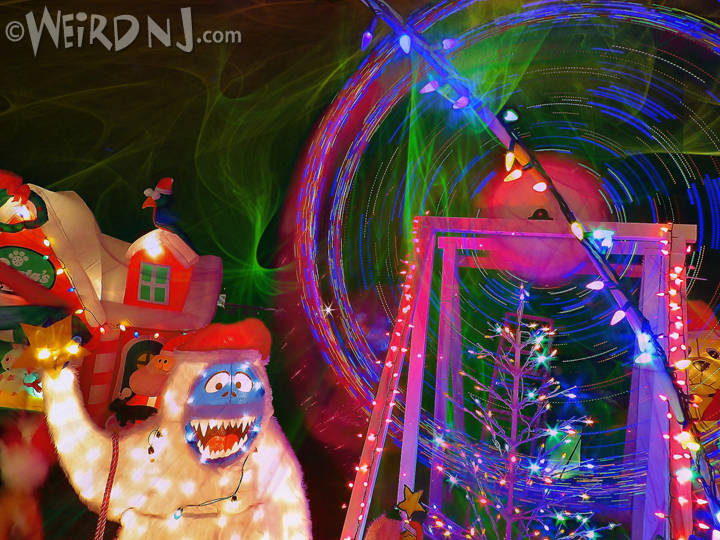 Bob Martel in his Colorful Wonderland of Holiday Cheer. And so as the wheel of holiday traditions rolls ever forward, it always rolls past the Martel’s Christmas Wonderland. Stay for a moment or an hour, drive by or walk through the yard…it’s up to you. But I will tell you this: It makes one hell of a great background for a selfie! So bring your camera. It’s a gift of loving holiday cheer all of NJ is welcome enjoy. The effort put into this ever-expanding extravaganza is such a celebration, a testament to dependability and faithful duty to decorate, it’s almost a mandatory requirement for any decent observer of holiday cheer to pay a visit to Bob Martel’s place. It is highly recommended that you GO SEE IT! A special thanks to Bob and the Martel Family for this very generous celebration of seasonal holiday cheer and goodwill towards our fellow man. Your gift to all who come to see is truly appreciated. 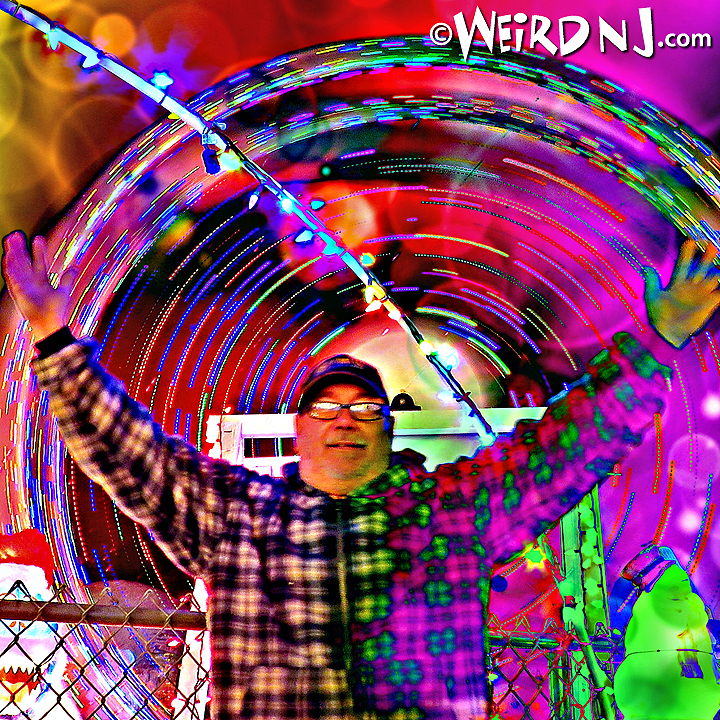 Merry Christmas to all from Weird NJ! Rich Robinson, your Weird NJ correspondent at large. 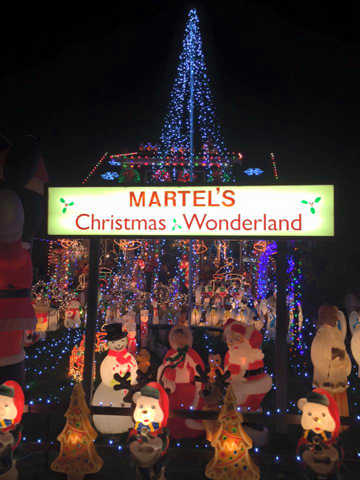 The Martel Christmas Wonderland is located on Phillips Ave. in Hamilton Township, Mercer County, NJ. For more information it is advisable to check their Facebook page. 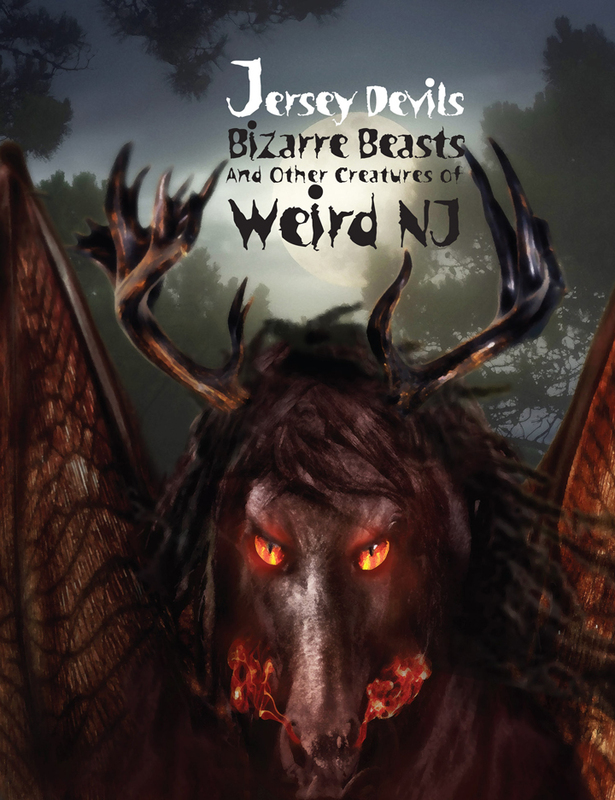 We have gone over the last 20 years of Weird NJ letters and emails about people encountering the Jersey Devil, Big Red Eye and other things they cannot explain. 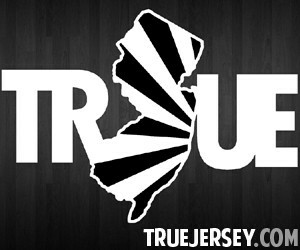 These folks have no reason to make these stories up, and they have no one else to tell them to, except here in Weird NJ. 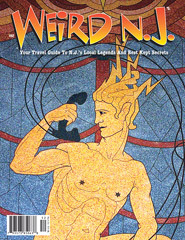 The brand new issue of Weird NJ magazine is now available in stores throughout the state and beyond! 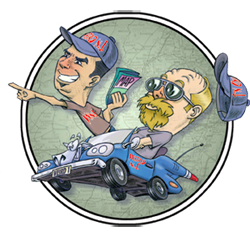 It may also be purchased through our Web Site and Amazon Store. 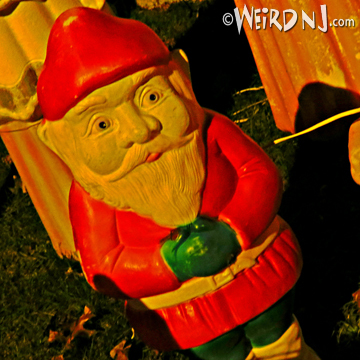 This entry was posted in Stories, Weird NJ Christmas and tagged Christmas, hamilton, lawn display, Lights, Martel, mercer county, Santa Claus, wonderland. Bookmark the permalink.